How to build stories for making a great movie? Cinema; the thought of it, the emotions, Heroes, heroines, action sequences, the story and what not brings great feelings. Cinemas are made of stories. Stories are mostly about love, good verses bad, heart touching, memorable actions, twists, turns and melodrama. We see people making movies for mainstream audience and some young aspiring artists making movies for online channels such as YouTube, waiting for a big break. A man walking on a road .. Suddenly something happened to the man walking on the road.. The man and the friend both went to a restaurant and recollect their memories. Then there is another way of building stories , called what story, how story and why story. A story about an incidence that happened in a village…. Boy meets a girl and falls in love but friends don’t like it…. How story. Stories that tell how that happened. There is a big hole made in a haunted house.. Villagers are thinking how that could be..
How can friends think the boy should not love the girl..
Why story, analysis of the issue. So by having a template like above we can make our imagination work to create stories. Modern cinemas are now made using cutting edge technologies and are influenced by modern society’s change of tastes. 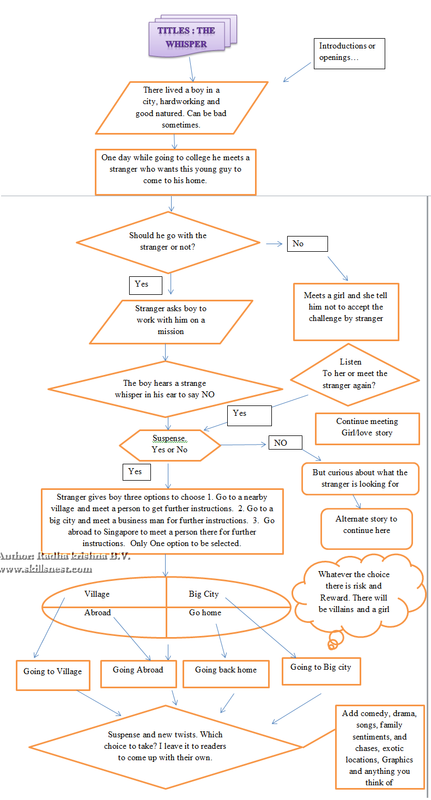 Now being a Software guy I thought of creating a cinema template in the form of a flow chart. I’m using Microsoft word flow chart diagrams , so there will be a limit to my imaginations. But let me try. The idea is to create a flow chart which can give us multiple choices for a particular theme. The flow chart enables us to come up with several logical conclusions while building some complex themes. So this template will be quite useful to test different ideas with a particular theme. To create some great stories the trick is not to use the language Cinema people use. We have to change the language in order to come up with more creative stories. one such tip is to select a word and build a story on that word. For example in my flowchart i used a word called “Whisper”. The flow chart for making Movies by RK skillsnest.. Better life with Best practices.